Are You A Big Part Of Their Life? It’s amazing how human interactions are. A person could change profoundly as a result of meeting someone else. Someone could be stabbed in the back and he could lose trust in all human beings. Someone else could fall in love and feel like the world is such a beautiful place, darkness does not exist except at night. Someone could get hurt and find themselves numb to future pain. A stranger could drop a coin into a beggar’s hat, smile at him and ask, “How are you?” and make him feel like a human being again. Another stranger could smile at a person having a rough day and make them feel like everything is going to be okay again. A third stranger can hurl angry words at a person who bumps into him and make him go home and feel like trash. The thing is, change is a constant, and the more people you run into, the more you’re likely to change yourself. The more people you run into, the more you’re like to change them. So be careful of every word you say, every step you take, every move you make. You don’t know who’s life you might be changing right now just by sitting here, reading this, and pressing share. This entry was posted in Inspiring Quotes, Life Lessons, Mind and tagged Life, postaday2011, quotes, wisdom. If someone shows you this much interest – or lack thereof – would you stay in the shop for long? Most probably not, unless you desperately need to. In Swahili, we say that this person amesheeba. In other words, he’s no longer hungry. If he was hungry for your money he’d cast the book aside and give you more attention. Similarly, if you look at the mediocre lives of ordinary people, you’ll find out that most of them are comfortable. They’re not so hungry. and this lack of hunger closes the door for them to look for something “more”. But the people who keep on moving ahead, they’re filled with this insatiable hunger for something more, which is why they will take that one extra step, do that extra thing, because they are unsatisfied, or they are hungry. Think about it this way. Sometimes failure is on its own a success, and success is on its own a failure. If you keep on failing, each failure will show you one thing that is not wrong in the whole process. However, immediate success doesn’t exactly make you examine things with as much scrutiny as if you had been failing all along, so you learn less. Therefore, you fail. Another thing that the world lacks nowadays is curiosity. Don’t get me wrong. People are curious but of course about the wrong things. They are curious why Mrs X and Mr Y got a divorce, why A and B didn’t go to country X for vacation. They’re curious about the details of each other’s lives. Remember that big minds discuss ideas and small minds discuss people. The curiosity that needs to be nurtured is that for knowledge. The problem with our generation is that we are the Xbox, Internet and Facebook generation that’s so overloaded with information already that we are no longer motivated to be curious about anything else. Be curious, turn questions into quests. Don’t be satisfied with the status quo. Curiosity is the fuel that makes people think at a tangent and come up with new ideas, in an attempt to work differently and thus come up with better results. This entry was posted in Inspiring Quotes, Life Lessons, Mind and tagged Life, quote, steve jobs. What if you wake up one day and discover that the autumn tree leaves that were supposed to go yellow and orange have instead gone grey? What if you wake up one day to the noise of construction outside your window when you’re used to the twittering of birds and burbling of water? What if it takes you ten years to realize that the greyness has nothing to do with the trees, but everything to do with your glasses? And the noise is just outside your window, and if you go to another part of the house, you’ll hear the birds and water again? They say that blindness is the loss of eyesight. A person could have vision that is 10/10 but deep inside he could be engulfed in darkness as a result of ultimate desperation. By definition, despair comes from the lack of hope. Imagine a person is plummeting into a bottomless never-ending hole. That’s despair; thinking that the suffering will never end. While it’s hard to imagine the physical sense of it, the psychological feeling accompanies people whose بصيرة (ba9eera) is blinded. A heart that’s flooded with Iman is said to have بصيرة, which is why a person should cry about the blinding of his heart – loss of بصيرة – more than the blinding of his eyes. Yaqeen is certainty; conviction in your heart about things that you can’t actually see with your eyes, hear with your ears or touch with your hand; conviction that everything you learnt through the Quraan and Sunnah of the prophet PBUH is true; conviction that everything that happens to a mu’min happens for the better. When the mother of prophet Musa aleihi assalam put him in a basket and set him adrift on the river, she did so with conviction that he will return to her. Yaqeen is related to حسن الظن بالله. And something that will help grow that yaqeen in the heart is the habit to complain to Allah only and as the proverb: “الشكوى لغير الله مذلة”This will also teach one how to “يناجي” Allah alone and this thing has an amazing taste in one’s heart and soul that is translated as happiness, enthusiasm, and optimism in the believer’s life. عن أبي العباس عبد الله بن عباس رضي الله عنهما قال : ” كنت خلف النبي صلى الله عليه وسلم يوما ، فقال : ( يا غلام ، إني أُعلمك كلمات : احفظ الله يحفظك ، احفظ الله تجده تجاهك ، إذا سأَلت فاسأَل الله ، وإذا استعنت فاستعن بالله ، واعلم أن الأُمة لو اجتمعت على أَن ينفعـوك بشيء ، لم ينفعوك إلا بشيء قد كتبه الله لك ، وإن اجتمعوا على أن يضروك بشيء ، لم يضروك إلا بشيء قد كتبه الله عليك، رفعت الأقلام وجفت الصحف ) . رواه الترمذي وقال :” حديث حسن صحيح “. This entry was posted in Islamic, Life Lessons, Mind and tagged Islam, Life, postaday2011, Success. There is no need to introduce Steve Jobs to you. His contributions to the world are many amongst them is the main reason I am able to start writing this post in the gym. 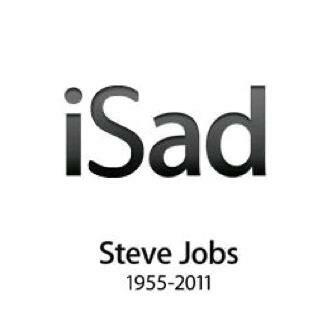 The co-founder of Apple gave a new meaning to the small letter ‘i’ and to a half-eaten apple. He left the company he co-founded in 1985 only to return again after 11 years to make Apple what it is today. He resigned a month and two weeks before his death, and he died one day after the iPhone 4s was introduced…so today’s question is, where were you when you heard the news? Did you get the news on your iphone or ipad? If you live in our part of the world, you probably got it early morning 5-6 am UAE time. I personally saw it on facebook and then twitter confirmed it. 1) Find a passion for your work. 2) Partner only with A players and fire bozos. 3) Get busy. Roll up your sleeves and get to work straight away. 4) Face hard decisions head on. 5) Design pixel by pixel. 6) Don’t consciously think about innovation. Systemizing innovation is painful, just be innovative. 7) Insist things that are seemingly impossible. 7) Again, you can’t connect the dots looking forward; you can only connect them looking backwards.So you have to trust that the dots will somehow connect in your future. This approach has never let me down, and it has made all the difference in my life. This entry was posted in Inspiring Quotes and tagged apple, Inspiration, Life, quotes, steve jobs.